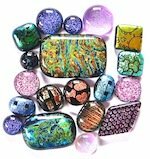 Fused glass cabochons can be made in a many styles from dichroic or fusing glasses. With the inclusion of dichroic these fused glass cabochons are widely used in glass, metal clay and chain maille jewelry. Dichroic cabochons are also used in fused glass earrings, pendants, bracelets, and necklaces. Making cabs is not difficult, as a cab only requires a piece of dichroic and a clear cap. After you have mastered this you may wish to experiment by using layers of dichroic and fusing them together. Kiln Wash or shelf paper. Dichroic on a clear or black base cut slightly smaller than the cab size. Clear cap cut 1/8” to 1/4” larger than the dichroic. Step 1. Place the paper on the kiln shelf and assemble the pieces with the cap placed evenly on top of the dichroic layer. The clear cap needs to be larger than the base as the dichroic layer can sometimes seep out from under the clear covering. Ripple dichroic may require a larger cap as the clear will sink down into the ripples. Step 2. These instructions are for Bullseye glass. As most cabs are less than 2’’ all round use the following firing details. If using a manual kiln set temperature to medium for about 15 minutes. Bring up to 1500 F (815 C) per hour and hold for 10 minutes. If using a programmable kiln ramp your temperature up to 1500 F per hour and hold for 10 minutes. Check that your cabs have fully fused. If not let the temperature return to 1500 F and hold for another 5 minutes. Step 3. Once fusing is complete turn the kiln off and open the door until the temperature reaches 1000 F (540c). Close the door. Repeat until the temperature is stable at the 1000 F.
Step 4. Allow the temperature to slowly drop to 978 F (525 C). Turn the kiln back on and hold at this temperature for 20 to 30 minutes. This is the annealing temperature, which helps reduce the stresses and strains that build up in the item during fusing. After annealing turn the kiln off and wait until the it is fully cooled before the cabochon. For programmable kilns you will be able to include these steps in your firing schedule. If the dichroic seeps out from under the clear cap, this may be due to the clear glass not fusing to the dichroic layer. Prior to fusing remove some of the layer on the edges, this will allow the cap to fuse to the base layer before it begins to spread. Air bubbles can sometimes be trapped between a ripple layer and the clear cap. Pre-firing with the ripple side down will flatten out the grooves and minimize air bubbles. Use a tack fusing firing schedule for this. You need to monitor this carefully to ensure you don’t over fire. Pouring clear medium frit into the ripples, capping and firing works very well in preventing bubbles.